Even if you are not having a baby yourself, chances are you know someone who is. If so, it’s time to start looking for great baby gifts now. All veteran moms know that new moms need diapers! Babies go through them in record speed and they are also an added expense to any family’s budget. If you want to be a hit at any baby shower think diaper cakes. Diaper cakes are stacked tiers of diapers made to look like a cake. It is truly an ingenious idea! You can purchase diaper cakes in various sizes and with sundry creative additions, like diaper wipes and baby soaps, balms, and combs. And you can even buy them designed for boys or girls and with various characters to make the diaper cake a delight to receive. Lil Baby Cakes, a mom-owned and created company, specializes in baby shower gifts. And, who doesn’t like supporting fellow moms, right? Plus, it’s wonderful purchasing from a mom who knows her stuff and understands what will become a great gift for other moms. Lil Baby Cakes carries everything from classic baby gifts like stuffed animals and photo albums to fabulously-designed diaper cakes and baby gift baskets. My favorites, though, are the diaper cakes. I think it’s because above all else the best gift I ever received at a baby shower was a basket of diapers. Onesies are great. Bassinets are fabulous as well. But, it’s the diapers that do it every time. Each diaper cake at Lil Baby Cakes is made from scratch (love that!) in a pet-free, smoke-free, clean environment and comes is a choice of three sizes, three, four or five layers. One of my favorite diaper cakes from Lil Baby Cakes is their 4 Tier Pink Contemporary Diaper Cake and it’s easy to know why. Not only has it has been featured in Better Homes and Garden magazine and the Source Book for Parents, but it is a hit among their customers as well. 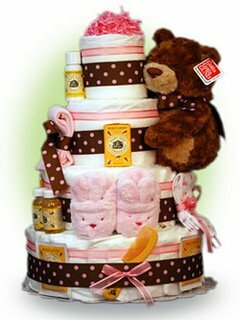 The 4 Tier Pink Contemporary Diaper Cake comes with 70 Pampers diapers, a plush teddy bear, two luxury burp clothes, slippers, Burt’s Bee premium brand baby lotions and balms, and a beautiful polka dot ribbon. You really can’t go wrong with a diaper cake for a baby shower. All of Lil Baby Cakes diaper cakes are beautifully made and will be an instant hit for any mom who is about to be busy with a brand-new baby. Previous postAre you a Co-Sleeper or Thinking About It? I took a look at their site and they really do have a nice selection of diaper cakes. I thought about making my own but I think buying one would save me a lot of time trying to figure out how to do everything. Thanks for the post.